I have asked this question before and don't know if I ever got a response. so why not try again. 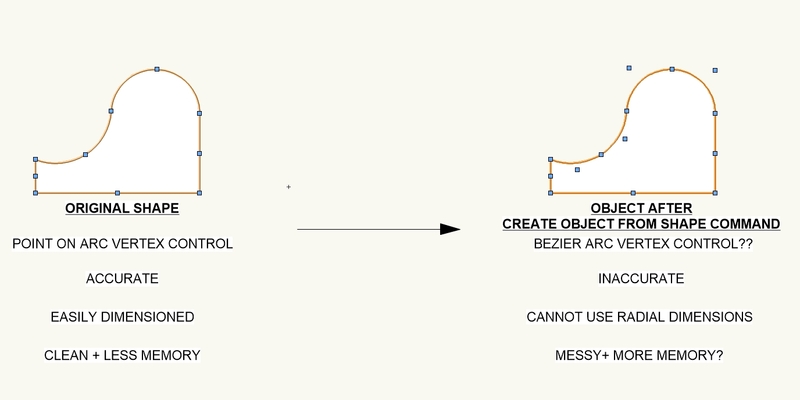 When using the CREATE OBJECTS FROM SHAPES... command to convert any basic object into something else (doesn't matter what), there is a conversion of any accurately drafted arc and radius information from a point on arc mode to a bezier mode. See the attached image for comparison. This is a frustrating phenomena/bug for the many reasons noted, but most importantly for the loss in fidelity. 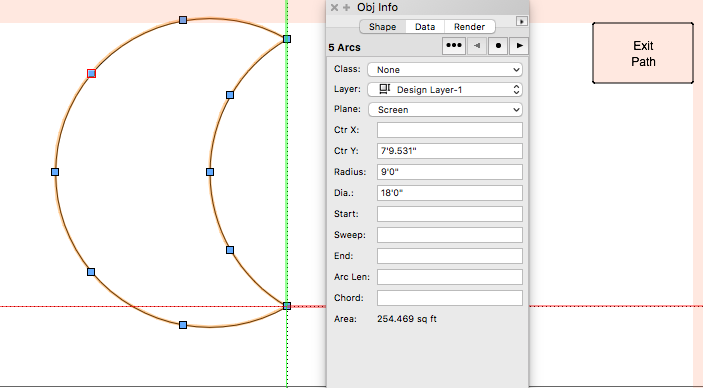 Once an original object is converted, there is no way to restore the original arc fidelity. I have requested a fix for this before and feel that this should be dealt with ASAP. even Extrudes and Solid Subtractions etc. Interesting. I'm not so much worried about the ability to dimension as I am what the dimension is measuring. If the original intent of the arc is compromised by the Create Shapes from Objects... command as shown above, then this creates room for error. Granted it isn't much error, but I am a big proponent of drafting accuracy and this phenomena flies in the face of that. Throughout a project, these errors, and the inability to efficiently fix them, add up and can wreak havoc. Are you running 2017 sp3? I'm not seeing these conversion to the same degree as in the past. Which 'Convert to Object' object is showing this for you? 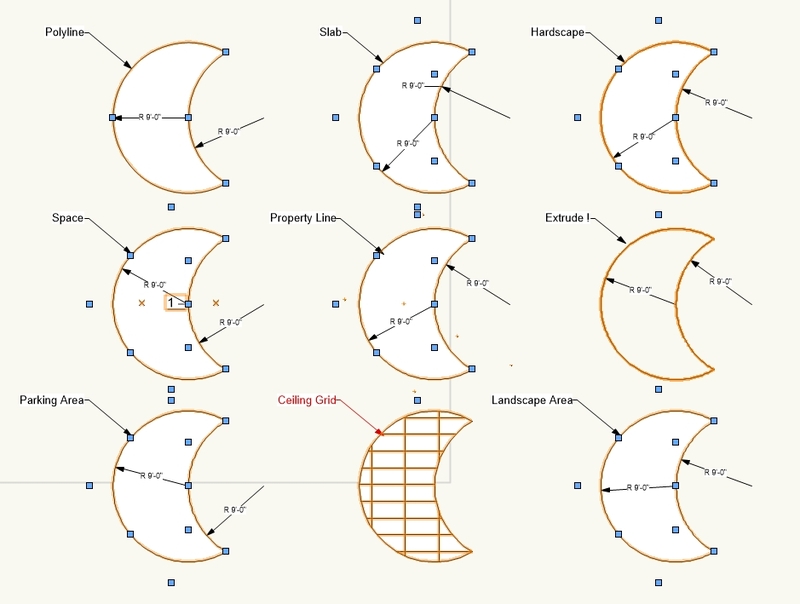 The source shape for all these objects, including the ceiling grid, remains a Polyline. Try to edit the vertices of any of the Convert to Objects... shapes. 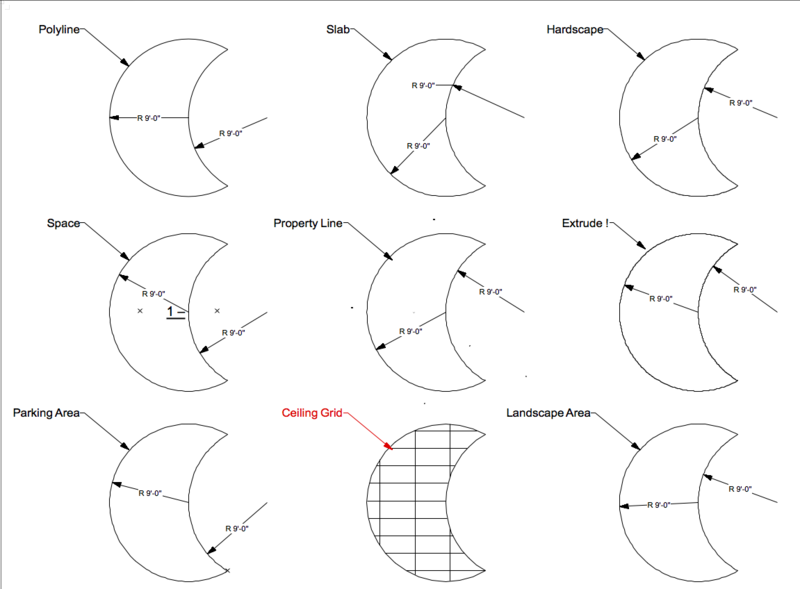 You will see that the original point on arc control is destroyed in the creation of the shapes, with the exception of the extrude and the ceiling grid. This is where the problem lies...the destruction of precise geometry. I see that it's splitting the arcs up for some reason but arcs they remain. My understanding is that there is no loss in accuracy in the current implementation. Ah yes, you now have 5 arcs instead of 2. That means the shape is much harder to accurately modify than originally intended. Because of this we encounter "slivers" often where the arc of two adjacent hardscapes interpolates differently and leaves a tiny gap in between. Plus, if I needed to modify a hardscape object's arc after this interpolation happens, I no longer have one point on arc vertex to alter, I have the bezier handles...and I don't even know where to start with those. Why can't 2 arcs = 2 arcs rather than 2 arcs = 5 arcs?...no thanks...added complexity, memory, room for error.